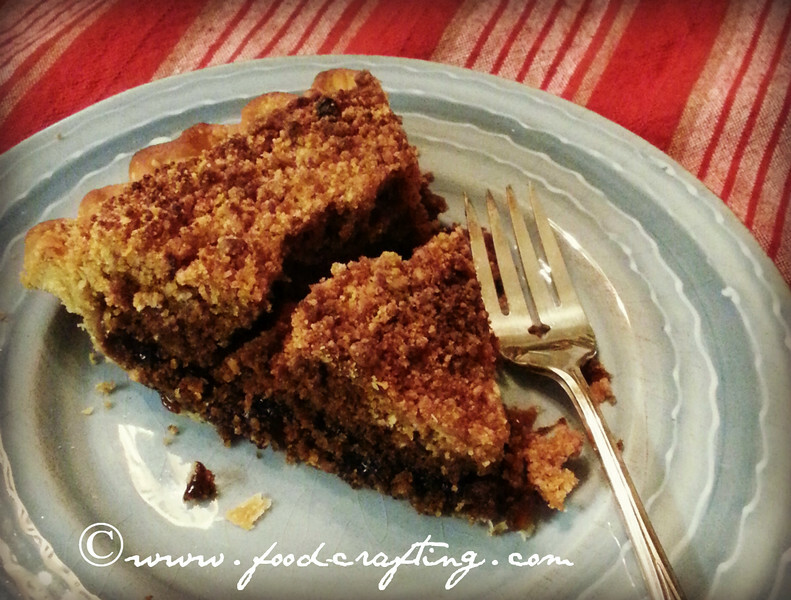 Pennsylvania Dutch Shoofly Pie – Time to bake a traditional Pennsylvania Dutch Shoofly Pie! In a hurry? Pin the recipe for later. Sure I read the news but the Food Section of the Washington Post® is a must-read. Over the years, my collection of recipe clippings fill several expandable files. Some of my recipe clippings date back decades. They are classics! I always look forward to Wednesdays and the yummy surprises found in that section of the paper. Clippings tend to be easier to collect than the entire section but it is now so much easier to look up the favorites in the paper’s “recipe finder” database where you can search for recipes by ingredient or name. Subscribe to the paper or buy the cookbook: You’ll want to try all the recipes! I’ll admit it… reading the Food section over morning coffee is sure to alter my menus for the rest of the week. 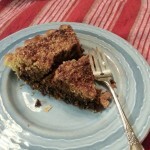 Wet Bottom Pennsylvania Dutch Shoofly Pie! Our favorite version is a wet bottom Bottom Pennsylvania Dutch Shoofly Pie! This week’s section did not disappoint. It had a huge section dedicated to Pennsylvania Dutch cooking and boy do we know about Pennsylvania cuisine. An entire category of this personal cookbook is dedicated to traditional foods and dishes from central PA as well as multiple anecdotes related to my introduction to Pennsylvania Dutch and Amish food preparation. Rather have cake than pie? Make It A Shoo Fly Cake! 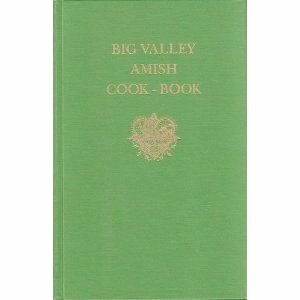 Big Valley Amish Cook-Book: a Cookbook From KishacoquillasRecipes From Big Valley!I am not sure how long it will take me to acquire the taste – or even be willing to sample – certain dishes. However, it does not mean I don’t prepare them for those family members who grew up with this type of cooking and those who have acquired a taste for certain recipes. I’ve acquired a taste for Pennsylvania Dutch Shoofly Pie. Hard to escape it when both your Dad and your husband hail from the same part of the state! And today, someone special is getting a Pennsylvania Dutch Shoofly Pie for his birthday! Tradition lives on in this family as it has since the first Pennsylvania German ancestor arrived on these shores courtesy of William Penn. One branch of the family is , literally, chin deep in German, Dutch , Swiss and even a little French 🙂 In this Big Valley clan, Shoo-Fly Pie is not only a family favorite but a must have at the Thanksgiving table. The pie just came out of the oven so as soon as it has cooled down, I will cut a piece for you. In the meantime, I will prepare the whipped cream. It’s a little bit of extra to top off the slice of pie and a throwback to the days when some of us (who shall remain nameless) had to find a way to tone down the intense spicy sweetness of molasses. To think that now I buy it by the gallon! Want It Plain or Fancy? There is difference! You might call it a coffee cake in a pie shell but holidays in this family would not be absolutely perfect without a Shoo-Fly Pie. Shoo-fly pie with a dollop of fresh whipped cream or extra creamy Cool Whip© on top! The moist spongy middle that gradually becomes drier as you get closer to the top. The top of the pie should have nothing more than a thin layer of golden brown crumbs. It’s all in how you assemble the few ingredients in our family Shoo-Fly Pie. I use a prepared pie crust (Thank you Pillsbury!) brought to room temperature. Short on time or not ready to try the “layering effect”? 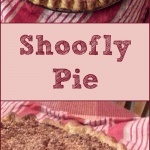 You can now buy Shoofly Pie ready made mix! Don’t miss this step ===> Have everything ready so the pie can be assembled as quickly as possible. It’s a Pennsylvania classic from our bake oven to yours. 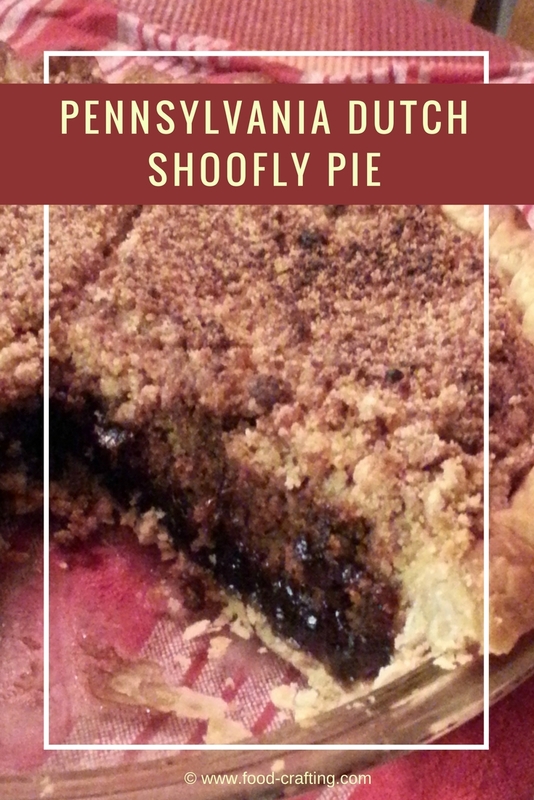 Shoo Fly Pie – A Pennsylvania Dutch classic #dessert from our bake oven to yours… Nothing says home style cooking more than a freshly baked Shoofly Pie. Prefer a dry or wet bottom #pie? Preheat over the 450 degrees. Line a 9 inch pie pan with the unbaked pie shell. Make sure the edges of the pie shell are fluted as high as possible. The liquid portion of the pie tends to bubble up and often spill. Cut the shortening into the brown sugar/flour mixture until crumbly. Set aside. Mix all ingredients for the liquid portion together in a medium glass Pyrex bowl and add hot water. Stir gently. The mixture will fizz as the baking soda reacts. In unbaked pie crust, spread half of dry crumb mixture, then slowly pour all of the liquid mixture in a concentric circle so as not to disturb the bottom crumb layer. Top the liquid layer with the remaining crumbs. The liquid will not be totally covered. Carefully place in oven and bake at 450 degrees first 15 minutes, then lower the temperature to 350 degrees and bake for another 20 minutes or so. The crumbs should not burn but turn a golden brown and the liquid should be oozing out along the edges. Although the filling does rise, it will shrink back down some in the middle as the pie cools. Posts contain affiliate links so readers can locate resources mentioned in recipes and articles. Merci. 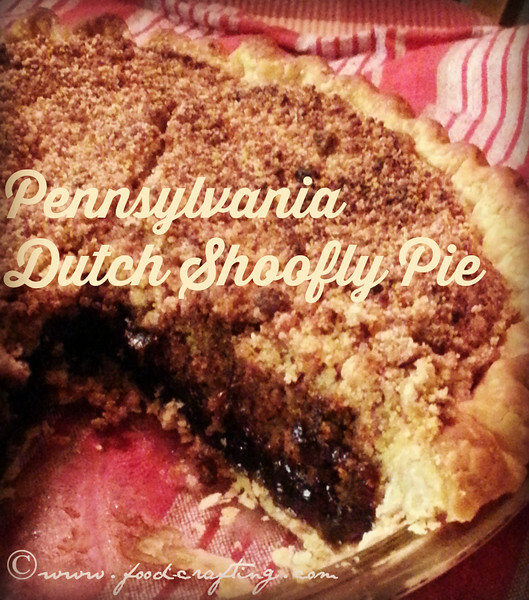 There are versions of Pennsylvania Dutch Shoofly pie made with dark Karo® syrup and without any spices at all. To our taste buds, it makes for a bland pie filling without the intense and traditional flavor of a true, Pennsylvania Dutch Shoo-Fly Pie. 2 Wet Bottom Pennsylvania Dutch Shoofly Pie! 4 Want It Plain or Fancy? There is difference! Rather Have Cake Than Pie? Make It A Shoo Fly Cake!